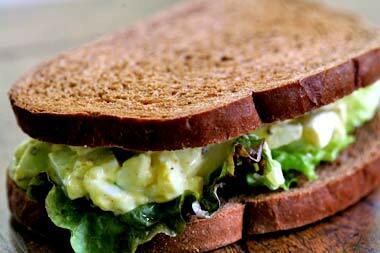 Are you looking for a healthier egg salad sandwich recipe? I was searching for one too, and then I came across The Yummy Life and found this great recipe. Traditionally, egg salad has alot of mayonnaise so it's high in fat and calories. This recipe will substitute the mayo with Greek yogurt; and honestly, it's better! The healthier version of this recipe has all of the protein and nutrition of eggs combined with high protein and low fat yogurt. It's hard to believe something this creamy is really good for you! Fresh dill gives it great flavor, too. Pair it with whole wheat bread toasted and spread on a little natural mayo and lettuce, and you have a delicious, easy lunch. Step 1. Boil the eggs. Step 2. Assemble the ingredients. Low-fat Greek yogurt, black pepper, salt, boiled eggs, fresh dill, and lettuce. Step 3. Drain, peel and cut the eggs in half. Step 4. Mince the dill. Don't include the dill stalks, just chop the lacy part. Step 5. In a medium size bowl, combine the yogurt, salt, pepper, and dill. Step 6. Combine the yogurt mixture with a fork. Step 7. Add in the chopped eggs and mash with a fork or blending tool. Step 8. Finally, Combine everything with the fork, using a light touch. * As a sandwich. Spoon 1/3 to 1/2 cup egg salad inside a split roll or croissant; or use whole wheat sandwich bread. Add lettuce or other greens to the sandwich, if desired. * As a pita. Insert lettuce or other greens inside pita. Fill with 1/3 to 1/2 cup egg salad. * As a salad alone. Add a 1/3 to 1/2 cup egg salad to top of a bed of lettuce or other greens. For more yummy recipes, check out The Yummy Life.